Old, damaged countertops do nothing but detract from the value and beauty of your home. Good news: There are many ways to get inexpensive countertops that still look good. Kitchen or bath countertops are some of the easiest parts of the room to cover or refinish. The costs can be minimal, and a professional painter or installer is not needed. Oftentimes, all a kitchen or bath needs is an updated countertop to look new again. Whether your outdated kitchen or bath is sporting faux blue marble tile or stained and cracked linoleum, it can be easier and far cheaper than you would think to update your countertop with these ideas. This is possibly the least expensive way to cover up old countertops, especially old wood or linoleum countertops. It’s very easy to paint your countertops yourself. Just sand, prime and then paint. You can use a pad sander, but sanding by hand will work just fine. Avoid sandpaper with a rough grit; choose a medium to fine grit. You just want to lightly scuff up the surface so the primer and paint will adhere; not leave deep scratches that will show through your newly painted surface. To avoid brush marks in your surface, use a spray paint and sealer (remove countertops first, or thoroughly protect non-sprayed surfaces with plastic and painter’s tape) or a dense sponge roller to apply primer and paint. Afterward, be sure to seal your paint with three to four coats of polyurethane to protect the finish. There are several countertop paints on the market, but unless you would prefer a specialty finish, any quality semi-gloss or gloss paint should work just fine. It is quite easy to cover up your countertops with different materials such as wood veneer, fabric or metal. I fashioned my laundry room countertop from an inexpensive wood door, three yards of fabric and a couple of quarts of Modge Podge. After much use, it is still holding strong. If you choose to recover your counters in fabric or paper (yes, paper can be used also), our video can help you understand how to decoupage. Use a 6-inch dense foam roller instead of a brush and cover the completed surface with several coats of polyurethane sealer. Most any fabric or paper will work -- wash the fabric first to preshrink and remove the sizing -- but PaperIllusions has been used to give a faux marble look to countertops with great success. 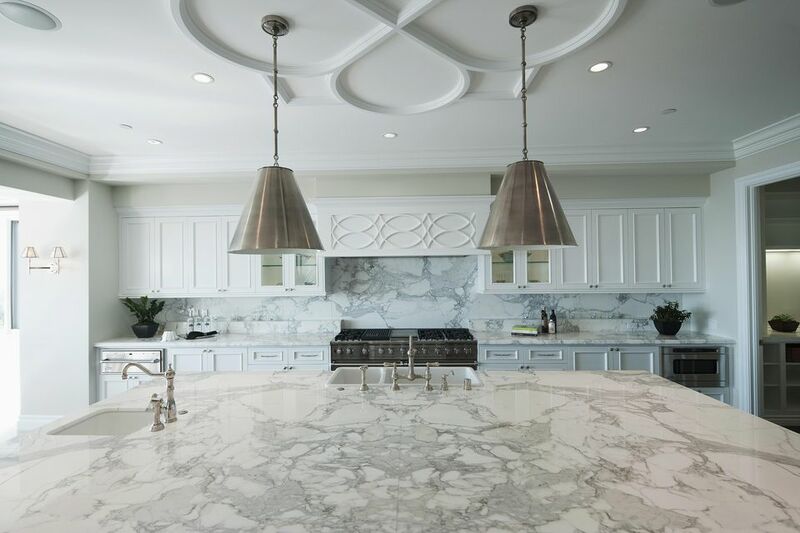 Tile can also be laid directly on top of most existing countertops, as well as layers of concrete or other malleable surfaces such as wood veneers or thin sheets of metal. Painting tile is tedious work and a successful finish is hard to achieve or impossible without a lot of careful prep work. However, if you are financially strapped and don’t mind a lot of sweat equity, painting your tile is an option. This article has some tips on how to successfully paint tile. Another option for updating tile is the aptly named “Tile Tattoos” by Milo. These tile tattoos, or decals, are touted as being completely waterproof and are available in a variety of styles. These products will not completely cover outdated or ugly tile but may be used to enhance or add flair to existing tile. Outdated countertops can be refashioned with just about everything -- from a “found” object mosaic to a layer of copper pennies. In regards to countertop ideas, almost anything goes. You’ll want to keep a few key things in mind when updating or refurbishing an existing countertop. Ask yourself these questions: Will my chosen finish be able to withstand daily use? If in the kitchen, can it withstand heat? Is it waterproof? If so, you can do it!